With its blend of urban sophistication and rugged outdoor recreation, Vancouver is a destination for any kind of traveler. 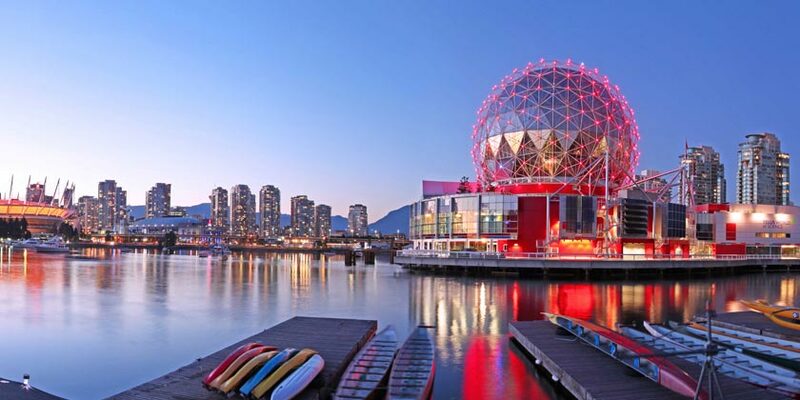 Spend a day exploring some of the city’s unique neighborhoods, like the bustling streets of downtown Vancouver, which boast a large variety of restaurants and shopping venues. The towering skyscrapers of the city are matched by the natural scenery and mountainous terrain of Deep Cove, a quiet neighborhood nestled in the mountains, which is a great place for recreational activities such as hiking, kayaking, or sipping coffee at one of the quaint cafes. For a good dose of local heritage and culture, don’t miss some of the must-see attractions like the famous Butchart Gardens, the historic city of Victoria, or any of the local museums and art galleries. Offering a wealth of activities, arts, culture, and entertainment throughout the year, Vancouver truly has something for everyone, and flight options with United Airlines® will send you on your way. The cruise travels through Vancouver's Inner Harbor and Burrard Inlet. Admire Stanley Park, the Vancouver skyline and other sights from the water. Capilano Suspension Bridge lets you experience the natural splendor of British Columbia. A 2-day city tour on a double-decker bus, admission to the Vancouver Lookout and entrance to the Dr Sun-Yat Sen Chinese Classical Garden. Resort info: A modern tower with panoramic views overlooking the city and mountain rimmed harbour situated in the heart of the city. Resort info: Rich in history, this vibrant and cosmopolitan property continues to attract kings, queens and Hollywood royalty. Resort info: Holiday Inn & Suites Vancouver Downtown Newly renovated and perfectly located in the heart of Downtown Vancouver. Resort info: With unobstructed views of the harbour and mountains, the hotel is a newcomer to an area rich in history and intrigue. Resort info: Offers guests the best of both worlds: the activities and cultural events of Vancouver, as well as a relaxing resort experience. Resort info: At Vancouver Marriott Pinnacle Downtown Hotel, you will discover a striking getaway that puts you in the center of it all.